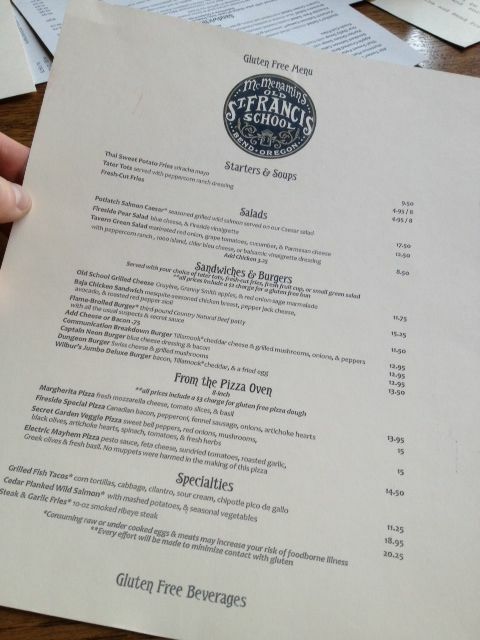 Gluten-free menu- McMenamins does offer a gluten-free menu. If you ever see a “Gluten-friendly” menu at a restaurant, my advice is to turn and walk out. Service-While I’ve received great service at this restaurant in the past, the service that my wife and I received on this particular day was very mediocre. The waiter was happy to provide a gluten-free menu and seemed somewhat interested in our needs when we adamantly explained that we would need our meals to be 100% gluten (and dairy) free. I ordered fish tacos off of the gluten-free menu and my wife (a celiac) ordered a plain house salad topped with chicken. The house salad originally comes with a few items that my wife is not able to eat so she asked if she could substitute those items with extra vegetables (a simple request) and, upon hearing the list of salad dressings from the waiter, ordered a raspberry vinaigrette dressing for the side. When my wife received her salad she realized that the server had failed to include the chicken that she had asked for. When my wife pointed out that she had asked for a chicken salad, the server (in a somewhat perturbed tone) said that he must have forgotten because of all of her other special requests. My wife then had to wait another 15 minutes for her chicken to be prepared before she could eat. I should mention that we visited this restaurant at 2:30 in the afternoon on a weekday and there were only a handful of other people there while we were. Knowledge- The waiter didn’t seem to have much knowledge in the area of gluten-free, however upon my request, I was able to speak to the manager who appeared to have a decent understanding of the significance of gluten-related disorders and the steps necessary to reduce the risk of cross-contamination. I was encouraged to learn that the manager was able to explain in detail the steps that the restaurant takes to reduce the risk of gluten contamination for gluten-free diners. Although I was not allowed into the kitchen, as they were still preparing meals, I was able to view their kitchen while the manager talked me through the steps on how the G-free meals were made. While viewing the kitchen area, I did find a couple of major risks for cross-contamination. There was only one pizza knife which the manager mentioned they “sanitized” before cutting a gluten-free pizza (they wiped the blade with a chemical solution to “kill the gluten”). Also, there was only one spatula for flipping items on the grill tops. This was just what I could see from outside of the kitchen. On a positive note, they did have a designated gluten-free fryer- unlike most other breweries. My concern with this kitchen area is that when the restaurant gets busy (which happens often) there really is no guarantee that precautions are taken to ensure that the pizza knife is thoroughly cleaned and sanitized prior to cutting every gluten-free pizza and of course, only having one spatula for the grill tops means that cross-contamination is not being prevented. Safety of food- While the manager did take a significant amount of time explaining the steps that the restaurant is taking to keep McMenamins safe for gluten-free customers, and it does seem that this restaurant is attempting to provide a safe environment for those intolerant to gluten, my wife was still almost served a salad with dressing that contained gluten. While reviewing the gluten-free menu with us and explaining the many menu items that are gluten-free (or could be made gluten-free) the manager happened to list the various salad dressings that contain gluten and listed the raspberry vinaigrette as one that contains gluten due to the beer that is used to make it. This was one of the dressing options that the waiter had listed as safe to eat and was the one that my wife had ordered. While we were able to change our order before being served the gluten-containing dressing, it was sheer luck that we received this information before being served gluten in our meal. In addition to this fairly major slip-up, the errors that I noted in the kitchen with the pizza knife and spatula were certainly serious enough to put gluten sensitive people at risk for cross-contamination when dining at this restaurant. Taste and cost/serving size- My wife and I found the cost and taste to be acceptable. Overall experience- I was definitely encouraged to learn that McMenamins is at least attempting to provide options to the gluten-free community. I would love to find a brew pub in Bend that offers a great menu and a safe environment for those with food allergies and sensitivities. While McMenamins is making an effort towards possibly becoming more gluten-free in the future, at this time I just don’t think they’re quite there yet as we just barely escaped without coming in contact with an unhealthy dose of gluten-filled raspberry vinaigrette. At this point, I would advise gluten-free diners to absolutely avoid ordering anything on a gluten-free bun or the pizza until changes are made implementing a designated gluten-free spatula and pizza knife. In addition, I also recommend being very careful when ordering any of their salad dressings or anything that comes in a marinade or sauce as this facility often uses beer in their marinades, dressings, and sauces. Considering the potential risks of cross contamination to mediocre service and the fact that our server didn’t seem interested in catering to a few simple special requests; and I have a difficult time recommending this restaurant to anybody looking for a safe gluten-free meal. I do plan to return to Mcmenamins in a few months for a follow-up review as the manager seemed very willing to implement some simple steps to reduce the risk of cross-contamination in the kitchen. In the meantime I’m afraid I can only give this restaurant a rating of 2 out of 5 stars. After such a horrible experience with our first gluten-free meal at McMenamins, we avoided this establishment for almost two years before being lured back. 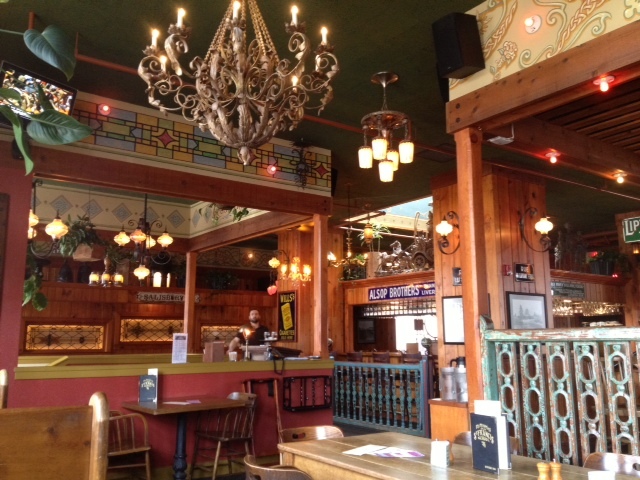 With atmosphere at McMenamins being second to none, my wife and I decided to take a friend visiting from out of town to this restaurant to give him a true feel of Bend Oregon. Our second visit to McMenamins was on a Wednesday night and we arrived around 7pm for dinner. Upon arriving we immediately asked for gluten-free menus and carefully explained that my wife and I are gluten and dairy free and that my wife has celiac disease (in addition to being 7 months pregnant) with hopes that they would be extra careful with our meals. Ordering off of the gluten-free menu, we began our meals with steamed clams and my wife ordered a relatively simple salad with chicken while I ordered fish tacos. Our steamer clam appetizer arrived first along with two huge chunks of bread on the same plate at the clams. Shortly after, my wife's gluten/dairy free salad also arrived with two more generous slices of bread topping the salad (and I mean sitting RIGHT ON TOP of the salad). At the end of our rope, we explained that we had ordered off of the gluten-free menu in an effort to avoid gluten and quickly sent the bread-topped salad and clams back with hopes of having luck the second time around. In the meantime, my fish tacos arrived and didn't appear to contain any obvious gluten or dairy, however I certainly had my doubts. My wife's second salad was served quite promptly, however with a quick inspection she noticed a small strand of cheese stuck to a cucumber and with further inspection found additional strands of cheese throughout the salad. This dairy would have easily been missed had she not inspected her salad before digging in. With this final *major* blunder, all hopes of us receiving a safe gluten-free and dairy free meal were out the window. After expressing our extreme disappointment with the manager, we left our untouched meals on the table and went elsewhere. For anybody hoping for a truly gluten free meal, I cannot recommend this establishment.